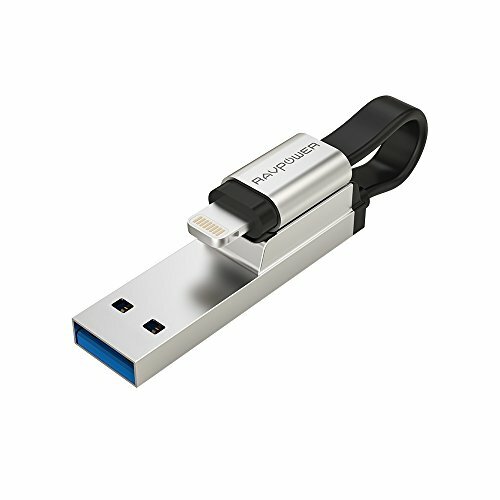 RP-IM013 is an 64GB iphone iPad flash drive USB 3.0 with lightning connector for PC. RAVPower iOS memory stick is MFi certified. It comes with 18 months of warranty. Multitasking is made easy with the RAVPower USB Lightning Flash Drive that supports charging and data streaming at the same time. Benefit from the magnetic design to conveniently fold and fix the cable for hassle-free in-hand use. The lightning connector easily fits most bulky cases with the extended length. Back up photos, videos, and other files straight to the pen drive with the convenience of a click of a button. Enjoy up to 80 MB/s reading and 30 MB/s writing speed with the USB 3.0 port from your computer to the thumb drive. For transfers from the iOS system, benefit up to 30MB/s reading and 10MB/s writing speed. Insert the jump drive into your phone and instantly enjoy your favorite movies and music on the flash drive with driver-free compatibility. You can also bypass your phone to take photos and videos and save them straight to the flash drive. Faster USB 3.0 Data Streaming: AUTHORIZED exFAT, enables you transfer individual files larger than 4GB. Experience up to 80 MB/s reading and 30 MB/s writing speed with the USB 3.0 port and up to 30MB/s reading and 10MB/s writing speed with the lightning port. Plug In and Play Direct: Save and play your favorite movies and music directly to the thumb drive with driver-free compatibility. PLEASE NOTE: 1) you could not transfer iTunes Music & Video files to thumb drive, as they are DRM (Digital Rights Management) protected. 2) 18 months of WARRANTY.